It’s been a while since adult Tilly/Alice has been prominently featured in an episode, which is quite a shame given that she is one of the more intriguing characters and offers almost endless potential stories. Her “origin” story is in full swing in this episode, which does a great job at bridging the past and the present. 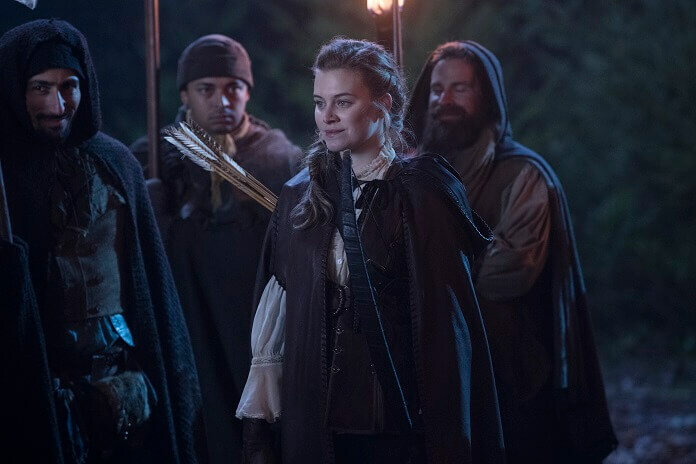 Between the Easter eggs, the coming of a new Robin Hood, a witch killer on the loose, and Dr. Facilier’s hidden agenda, we actually have an episode of Once Upon A Time that is worth watching. About 90% of this episode is dedicated to Tilly/Alice’s dueling storylines. Oddly enough, it appears that the flashbacks showing Alice in whatever fairytale realm the show has taken place in this season might actually have a bigger impact on the main plots going forward than her present-day counterpart. The last episode showed a younger Alice trapped in the tower while Hook frantically tried everything to save her. Roughly another ten years has passed between episodes, giving us a grown-up Alice whose only friends are inanimate objects that she talks to in the tower. Her actions plus her classic costume give some original Alice in Wonderland vibes right from the get-go. On her birthday, Alice wishes to be freed from the tower, and her wish is granted in the form of a big friendly troll ripping the roof off and whisking Alice away. Several more years later, Alice is lurking in the forest watching Hook, Henry, and baby Lucy. She is found by the new Robin Hood (Zelena’s daughter, who has been MIA for a few weeks), thus starting their journey together. The two girls get acquainted and get into trouble when they happen upon a mob of villagers that want to go after a monster that has been destroying villages. Alice realizes that her friend, the troll, is back and tells the group that he is harmless. Robin also wants to fulfill her father’s legacy by taking down the troll and proving herself to the villagers. The villagers decide the girls aren’t worth the trouble and throw them into a prison. Robin tells Alice about her life in Storybrooke and how she came here to prove herself and live the life she always wanted. However, we have some massive timeline issues because Robin mentions that she grew up in Storybrooke and even stole Emma’s car once. If Robin grew up in Storybrooke, how is she the only character that has aged? Also, I’m pretty sure there is no electricity in the middle of the forest, so how does her smart phone still have a charge? After some nice bonding time, Robin escapes and leaves Alice locked up. Robin rejoins the mob and goes for the kill when they find the troll in the woods. Alice comes out of nowhere and makes Robin miss the shot to save the troll. Well, the mob is very unhappy and decides that they should just kill the girls. Alice makes another wish and Emma’s yellow VW bug comes out of nowhere to give the girl’s a safe escape. Once they are away from the mob, Robin realizes that Alice has magic and explains how she must have created both the troll and the car. Alice having magic could be huge down the road for many reasons. It is likely that it is not known that she could have magic, plus Alice has never had magic in any other version of her story. My bet is that Alice/Tilly will be the key to fixing everything in Seattle by the end of the season. Back in Seattle, Hook is trying furiously to prove Tilly’s innocence in the murders of the two people at the hospital. He enlists Henry’s help in tracking down any sort of alibi to exonerate Tilly. Interestingly, Tilly doesn’t remember what had happened the previous day at first and says that she feels as if she is two different people. She is the only character to be stuck in between real and fake memories, which makes her a very important and intriguing character. Hook and Henry go searching for clues, while Tilly wracks her brain to remember where she was at the time of the murder. No one remembers her wherever she goes, which made me think that there is some magic in Seattle after all. Tilly winds up going to the troll statue at the bridge for comfort, thinking that there is nothing else she can do. As she talks out loud to herself, she notices that one of the troll’s eyes has a blinking red light. Hook arrives to take Tilly to the police station, and they realize that the security camera could prove her innocence. Hook pulls up the footage from the camera at the time of the murder, and sure enough, Tilly is standing in front of the statue. So, Tilly is slightly less crazy than everyone thinks and is set free. She bumps into Robin, who has just come back to town, making it likely that their story will play out before the series ends. Tilly’s story closes with Hook going to her home and offering to let her stay with him until the murderer is found. Tilly accepts, and this could be what Hook needs to wake up. The non-Alice/Tilly related story of the week focuses on Regina and Lucy beginning Operation Hyacinth. Regina convinces Facilier to go on a date with her and tapes his door lock so Lucy can sneak into his apartment while he is gone. Lucy is on recon duty and only finds one thing pointing to what Facilier is up to: On his table, there are a bunch of cards laid out in weird patterns. Lucy is concerned when she sees a death card and takes a picture of it. While Regina and Facilier are out and about, Zelena runs into them at the worst possible time. Not only does Zelena break up the date; she ends the distraction. She now knows that Regina has been lying to her about Facilier being asleep. After a short quarrel, Zelena understands the mission and the sisters make up. Regina tries to warn Lucy that Facilier is coming back, but Lucy doesn’t see her message. Lucy is almost caught and leaves when Facilier goes upstairs. Later that day, Facilier visits Regina to return Lucy’s hat. Facilier knows that Lucy was snooping around his place and tells Regina she could have just asked him what his plans were. He also reveals that he is in town to kill Rumple and take his dagger to become the Dark One. Regina is more torn about this than she should be because Rumple is her oldest friend, but she now has feelings for Facilier. Let’s hope Regina comes to her senses and is still a hero so she can stop evil in its tracks.